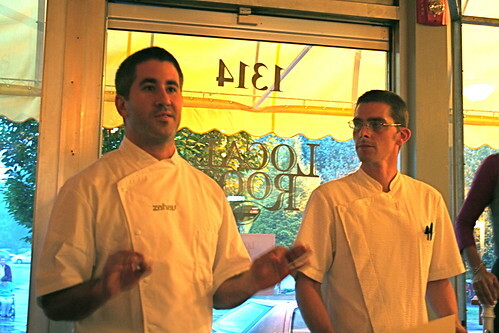 Last Wednesday, September 29, I was lucky enough to score two last minute reservations to the Michael Solomonov guest chef dinner at Local Roots, the local foods-oriented restaurant here in Roanoke. Back in August I wasn’t able to make it to the Sean Brock/Bryan Voltaggio/Ashley Christensen/Tarver King/Josh Smith (the chef at LR) dinner that spearheaded Local Roots’ James Beard award events, so I wasn’t going to let the second dinner in the series go by. The creativity and ingredients and verve of the first event seemed incredible, and with a chef like Michael Solomonov, one of the innovators in modern Israeli cuisine, I figured the night would be unforgettable. Ok, so on to the event itself. The evening was rainy and grey, but as soon as G & I arrived at the restaurant, we were whisked into the warmly lit, cheerful interior that is Local Roots. The usual music played in the background (a mix of Neutral Milk Hotel, Wilco, and jazz), but each table glittered with candles and flowers, and nibbles of exciting goodness floated throughout the space in the careful hands of servers. The first order of business was to nab our complimentary cocktail, the L’Chaim, a mix of pomegranate juice, Hendrick’s gin, lime, simple syrup, and mint. Definitely refreshing, floral, and fruity, the cocktail was a good start to the night (though I would have loved to have seen some extra garnishes like pomegranate seeds or pollen or something to jazz it up). G mused about how we need to start mixing with Henrick’s more, and I agree, there’s just something I love about the floral gin, how perfect it is for lighter, more refined drinks. Not necessarily the best gin for autumn or winter, but next spring and summer I’m going to get on that. 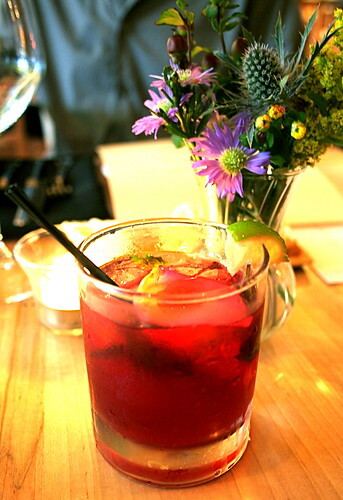 While sipping our drinks and people watching (surprisingly we knew no one there–who are these Roanoke food lovers? Why are they so old?! 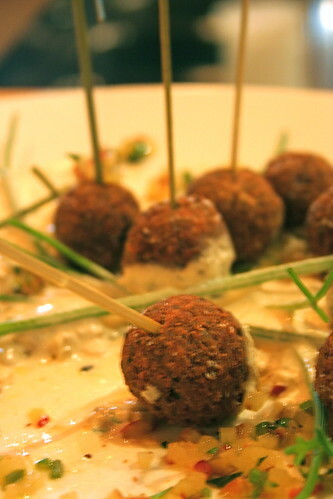 ), we happily grabbed at some edamame and sea island red pea falafel with tahini and an apple walnut salad. The falafels were perfectly cooked, with an amazing (and satisfying) crunch (lended by the red peas, I would guess). The sweetness of the apple walnut salad paired nicely with the smooth tahini and crunchy, fried falafel, and it was hard not to keep gobbling them up every time a tray passed by. I did eat two, the limit I gave myself since I had a five course meal coming up, but I think I could have eaten an entire entree sized platter of them. 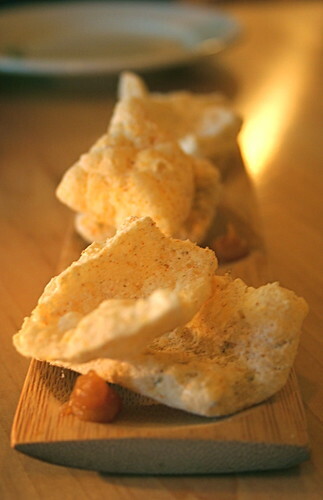 The other nibble that I swooned over was the puffed cheddar pork rind. I think my mother would gag at the thought of me eating pork rinds (definitely something we made fun of in the service station stores in Georgia–who on earth would buy pork rinds on a road trip? ), but I loved these. As a first pork rind, I may have been spoiled–these were crunchy and puffed and dusted with a fine layer of powdered cheddar cheese, not unlike a large cheeto (but 10x better), and served with dollops of some kind of sweet apricot compote on the side. I was grateful that G didn’t eat the 3rd rind on the wooden plate (which I’m in love with and want to buy ASAP for my own home use), though he eyed it longingly. The pork rinds get an A+ for awesomeness in my book. After forty minutes or so of mingling time (of which we just stayed at the table and talked about food, ordered our bottle of Villa Appalachia wine–the wine pairing was $45 each, which was rather exhorbitant given the $90 price tag of the meal to begin with; I’m definitely of the opinion that wine pairings ought to be included in that price, or at least in a meal in the $100 range)–Josh Smith, the executive chef at Local Roots, introduced Michael Solomonov (the chef on the left), and they got the meal started. Before the first course, a few pieces of Local Root’s multi-grain (12 grain?) 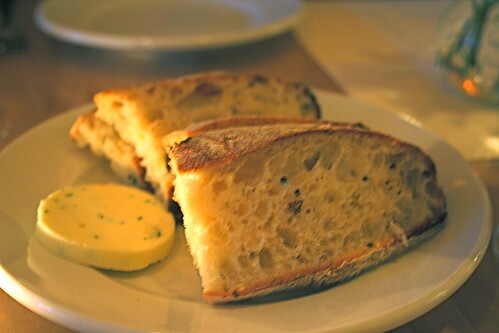 bread was served with a parsley compound butter. Surprisingly, the combination of grains + the perfectly browned and blistered crust from the wood fire oven gave a matzo tone to the bread. I’m not sure if that was intentional (and I’d love to know if it was), but it really gave the affect of leavened matzo. First course was, I believe, my favorite of the evening. As far as I can tell, the oysters were breaded in a sesame crust, fried, and served on top of an “Israeli Salad” & oyster tartar consisting of cucumbers, capers, and fennel with a dollop of celery sherbet on the side and a drizzle of tomato consume on bottom. I’ll let it be known, I love oysters, and I love a good oyster, and while the fried oysters were good, I was more drawn to the “Israeli salad,” oyster tartar, and celery sherbet pieces of the plate. The oyster tartar was rich and fresh, the sherbet gave an aromatic punch, and the acidity of the consume was perfectly balanced with the fresh crunch and melt of the oysters and salad and sherbet. This course was creative and what I expected from the evening–a blend of old and new, local and middle eastern. The second course left me wondering what exactly on the plate represented modern Israeli cuisine. Trout? Corn? Pickled Garlic? Potatoes? All are Appalachian in scope and what I might expect from Local Roots on a random Tuesday night, but not what I expected from a special event dinner. It was good, don’t get me wrong, just confusing. And, to be honest, the trout was oversalted on my plate–a pinch less would have been nice. 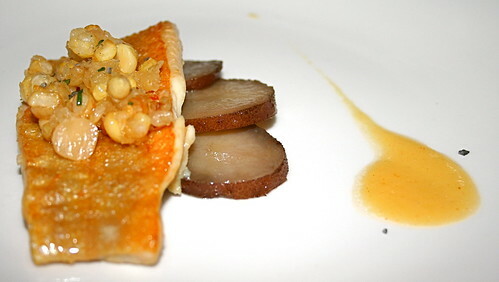 The golden trout, of course, was sourced from my employer, Big Pine Trout, and the fried corn and pickled garlic topping was nice (though the garlic was indiscernible), the potatoes tender and tasty, but the dish was one-note to me. Yellow and tan and salty. The sauce, at least, elevated it a bit–a blend of corn stock, chicken stock, and pickled mango–but the dish as a whole left me wanting more of Solomonov’s creativity. If the second course left me wanting more of Solomonov and the mid-east, then then third course definitely made up for it. But in the wrong way. 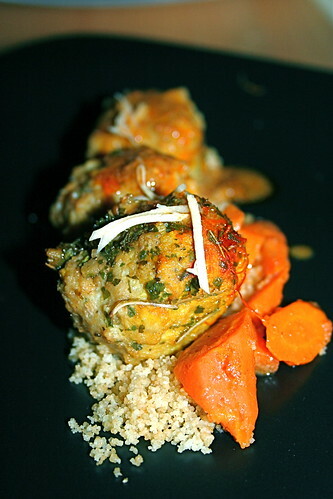 Chicken Kefta, carrots, cous cous, harissa–all are definitive middle eastern dishes and ingredients. This, however, was the problem–the course was too traditional. And I don’t mean to sound like I’m picking bones or making mountains out of mole hills, I’d certainly take the kefta over the trout any day (especially in a meal billed as modern Israeli cuisine), but I wanted more: more creativity, more innovation. The kefta was moist and spiced nicely, the carrots tender (sous vide?). The cous cous gave a good texture contrast, but half of mine was extremely dry. And the part I was most excited about, the harissa, was undetectable, faint, and lacking even the tiny kick I was hoping it would give the dish. I know that most wouldn’t like food to be seasoned as hot as I prefer mine, but even just a little punch to wake up the palate would have been appreciated. I did enjoy the kick of the shaved ginger on top; it freshened the dish a bit and I would have liked to have seen more unique touches like that. I wanted to like this course, I really did. And I did for the first couple of bites. I love lamb. I love perfectly cooked lamb. I love perfectly cooked, grass fed, happy, local lamb. 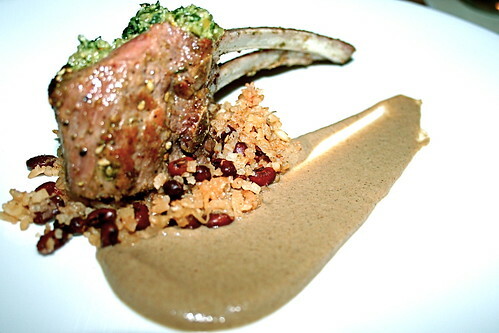 And the first four bites of my lamb chop were great–medium rare, seasoned perfectly, with the crunch of the field pea pilaf and smooth saucing of the eggplant and anchovy baba ganoush–but then I realized half of my chop was raw. Rare. Raw. Bloody. Uncooked. In any other circumstance I would have sent it back. But in a timed plating like this? I was left with only half a chop. 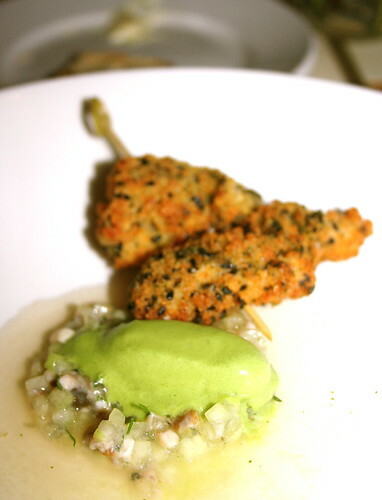 And as much as I like lamb tartar, this wasn’t supposed to be tartar. It was supposed to be medium rare. It was supposed to be edible. It was supposed to be 1/5 of a $90 meal. Not only that, but the dish, even if cooked properly, was so brown I couldn’t understand it. Just a touch of freshness would have been nice. Or a bit of acidity (a grape relish or something of that nature would have been delicious on the chop). The field pea pilaf, though tasty, was dry and brown. The baba ganoush, though tasty, was brown. The chop was brown. And while the tabbouleh on top of the chop was green, it was parsley and didn’t lend much flavor to the dish as a whole. And, as with the last course, nothing was all that creative or unique. I wanted to like it, but I couldn’t. How much of that was related to the raw meat? I’m not sure. But overall, it could have been brighter, it could have been more. Ending the meal was the dessert course, and what a course it was! Whereas courses two through four were not all that successful, this dessert made up for it (and I’m glad the meal started and ended well). From the moment I saw “orchid root custard” on the menu I was hooked–what exactly is an orchid root custard? What will it taste like? Will it work? And work it did! The custard was smooth and rich, with a floral and licorice tone, the sauced peaches a nice bright touch. 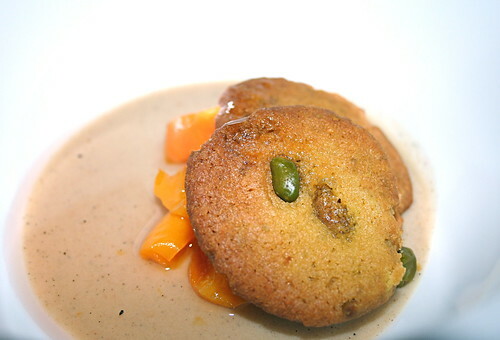 And the crunch of the pistachio cookie was lovely, gave a good buttery contrast to the otherwise rich and creamy dish. The dish was light and lifting, over-all pleasing, and a perfect way to end the meal. Whereas I’d been disappointed about the lack of creativity, this course was bursting with it, and I felt like I understood where the chef was coming from. I could have eaten two bowls of the custard. Seriously. It was that good. Ending with the pop of a rosewater candy and the paying of the bill, G & I sauntered out into the evening, bellies full and with a lot to discuss. Highlights of the meal for me were the appetizers and the first and final courses. Raw lamb and some salt issues aside, the meal was delicious overall, but it wasn’t what I expected, and I’m not sure it was worth the price tag. It was a good meal. But $90 without wine pairings good? It’s up for debate. Am I intrigued by Solomonov’s vision and would I eat at Zahav in Philadelphia? I think I would. I think he has an interesting take on food, as evidenced by the Hors d’œuvrs and oysters and custard, but I think elements of the courses pushed him away from that creative eye and hand. But pass me some of the edamame falafel and a oyster tartar and I’ll sit back as a happy woman–thank you for that Michael! What a meal! The plates look fairly small (or am I wrong? ), which seems like a good thing since there are so many courses! That dessert sounds so interesting, I have never heard of cooking with Orchid root. How has your body done with the adjustment of adding dairy and meat back into your diet? Was is a system shock or a smooth transition? I’m always getting email about local, multi-course dinners, and have yet to attend one. I really want to, and judging by the selection you got, it seems like a great idea. Everything looks so delicious! Jes – once again, your photos are beautiful. And your descriptions are really engaging…should we end up there I look forward to taking advantage of events like this! That’s some gourmet looking food! Wow! By the way, I highly recommend that you track down the episode of Dirty Jobs wherein Mike gets to make pork rinds. It’s … illuminating.